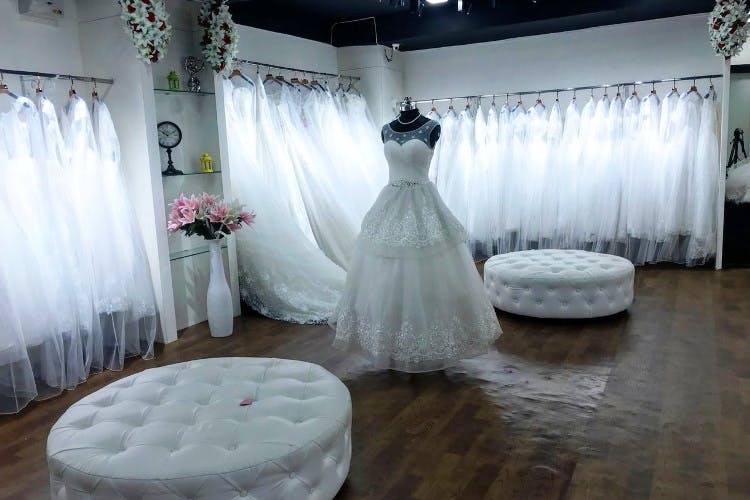 Girlies, we have all dreamt of walking down the aisle in a white gown for our fairytale wedding, and Ashnah Christian Bridal store is making those dreams come true. If Meghan Markle's wedding look gave you goals, you should check out Ashnah Christian Bridal Store, near Forum Sujana Mall. It has two showrooms, and the smaller one is basically an apartment turned into a store. While it has a galore of bridal attires, the bigger one (located a few steps away) looks nothing short of a bridal store in NYC. With over 3,000 gowns that come in various patterns, this store is bae if it's a white wedding that you want. Think all lace, mock neck, embroidery, pearls, and beadwork, off shoulders, corsets, tiaras, trains, and veils, and you will find it here. They have sofas for your girl gang to make themselves comfy while you try out various gowns. The founder of the store, Ashnah, along with the staff will also assist you to find the right size, and pattern according to your needs, body type, and budget. Want something offbeat? Get a wedding gown dyed in soft shades of gold and orange, this store does that too. Besides, you can get ready made, imported wedding gowns for as low as INR 10,000 here, so we think it's time to ditch the tailor and get a designer piece for your big day. You can also buy elegant accessories like hairpins, brooches, and flower crowns here. We wish they had outfits for the bridesmaids too. Although they have free size gowns as well, you can get any piece altered for a perfect fit here.